After answering many of the same questions to new folks joining the server (again, and again...and again), I've decided it's high time to make some sort of reference I can point to that folks can read or watch to learn what makes our server unique. Though I'm a casual youtuber at best, I'm planning on presenting the best ones in video form in the future, but want to make sure I'm not missing anything too obvious. How old is the map? The 1.13 map opened 8/6/18, so you do the math. My ping's really high, where is this server exactly? Canada. Firespread is OFF - otherwise, the lag would be unbearable. Spawn coordinates are [-45, 281]. Food: If needed, you can buy food from one of the spawn villagers using rotten flesh, seeds, bones, or vote fish. Great for when you're first starting out, or no one else is online to trade with. The map is big - 350 K block radius (700,000 blocks across). There is a world border. RTP takes you anywhere between 1-5,000 blocks away from spawn. Choose the pad that's in the direction you want to go. If you join with a friend, don't hop on the RTP pads right away! Everyone who's sharing a teleport needs to cluster around a single pressure plate for it to work right. 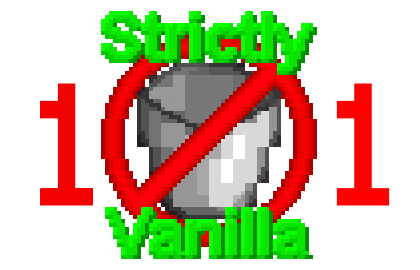 "Since we are a 100% vanilla server, and we do not have any mods or plugins to reduce lag, we ask our players to keep their creations as lag free and server friendly as possible." "Overworld Gold Farms / Nether Portal Gold Farms are banned from use. All gold farms are to be in the Nether." "Entity Limit is 300 per loaded area; If you see your entity count go over 300 in any section of your base your need to reduce the amount of entities in that area." "Max Entity Cramming game rule is set to 100. This game rule prevents more than 100 entities from occupying a 1x1 area." I'm not including ALL the one's I've already got, since I want to see what first comes to mind for some folks and want to leave some for the rest of you to bring up (which will also tell me if we have the same beginner-tips in mind). I would add in something about griefing/raiding, as that (or so at least I've seen) has been asked about by a ton of new players. The griefing/raiding question does come up, but we can't answer it before they are through with the quiz. And then it comes up like they're incredulous. Well that's the thing, this video isn't available ON the server in chat, so I don't consider it "Telling someone the quiz answers" - If someone goes to the effort to find and watch a video about the server they're going to join, they're going to get a lot of useful information in addition to that tidbit (though I'm planning on wording it carefully to imply, not outright say "Griefing is allowed on the server") so I think it's worth it. One of the first important things players on the server need to know about, is the fish currency system. Players tend to ask how to get back to spawn right after leaving. They tend to join a few mins apart from their friend and have an annoying time getting together. If a player votes and banks before they wander off they will be able to get back to spawn a few times on their first day rather than needing to wait or walk to spawn. Knowing this might be quite usefull for newer players. Explaing where spawn is and the various ways of getting there might be good. also players tend to ask how large the map is quite often so adding a part about that might be usefull for some. another frequent question is how old the map is and how often it wipes. This is all usefull info for players looking for a new server. I'm not completely sure if this is worth it because if you think about it in the perspective of a new person to the server they might want to take time out of playing to go veiw these videos on how to play, ecspecially younger, more impatient players. I am willing to help with it though.